Dream It Live It Love It! Cater Hire Limerick brings you all the expertise,enthusiasm and products you need to make your event that extra bit special. For Over 20 Years we have been regarded as one of the Best Event and Party Hire Companies in the country, by our exclusive list of clients Creating distinguished, sophisticated events from Grand Gala’s to Intimate Celebrations Throughout Ireland. Most of Clients rely on our Discretion and We Pride Ourselves on Protecting Their Privacy. Our Company Ethos is based on genuine care of our clients, our staff, our suppliers and the quality of our products and services. 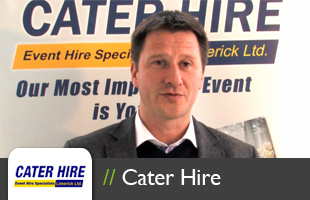 Excellence is the Focus of Cater Hire Limerick and we are a company with a firm commitment to creating an enjoyable, positive experience for all those with whom we work. Behind all our commitments what it really comes down to is We Know How To Throw A Good Party! Our Close Knit Team is made up of Management, Event Planners,Warehouse Operatives and Delivery Personnel, Every Single Team Member is Committed to Delivering Excellence In Everything We Do. There is a moment during an event when the client stops and takes everything in. The look on their face, the satisfaction and the joy is what we all love about our work! We Love to Laugh (a lot), We Love to Meet Happy People and most of all We Love Coffee: Lots and Lots Of Coffee!